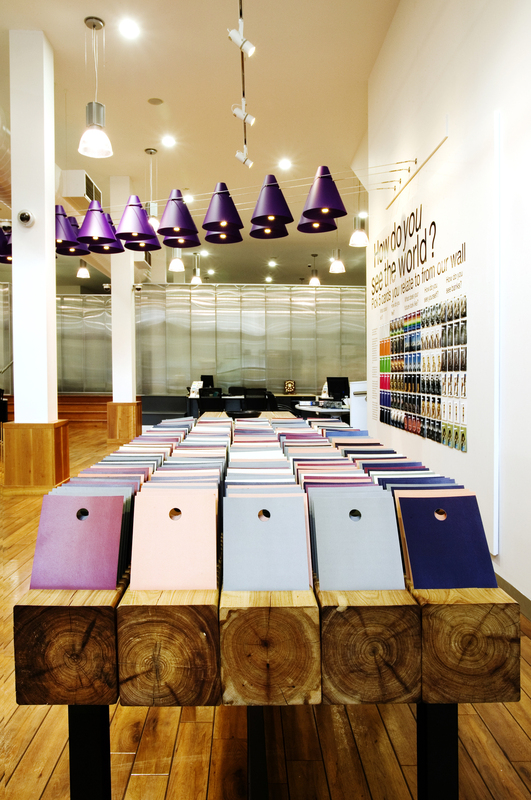 The design of the CUA flagship store fit out in Perth has been addressed in stages. We began with a pop-up customer engagement exhibition. This work has been done in consultation with Simon Hammond from Hammondthinking to ensure alignment with the branding development and work CUA is doing. We are designing this to keep the cost as low as possible while achieving maximum impact. The exhibition installation is made up of a series of elements. These have been set up within the shell of the tenancy. Our first task was to minimally refurbish the shell. 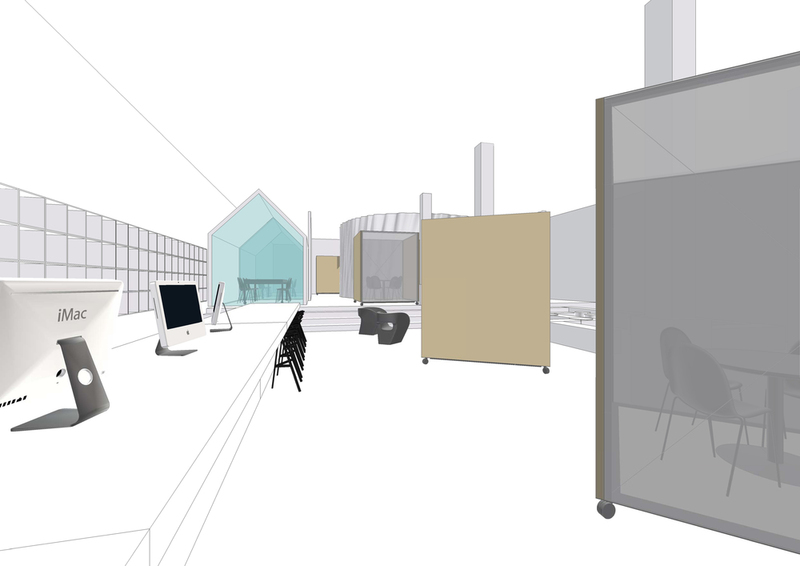 Then we started to insert the new exhibition and fitout elements. The front window has a headline question or comment for passers by to read. The message is made up of 3D painted letters sitting on clear acrylic suspended shelves. The slightly provocative questions or statements are changed each week by the bank staff. The statements respond to local news headlines while also raising issues about the value of banking and money for your customers and potential customers. The text in the window is intended to startle and engage passers by. We want passers by on the street who are not customers and may not even have heard of CUA to come in and 'vote' at the exhibition. 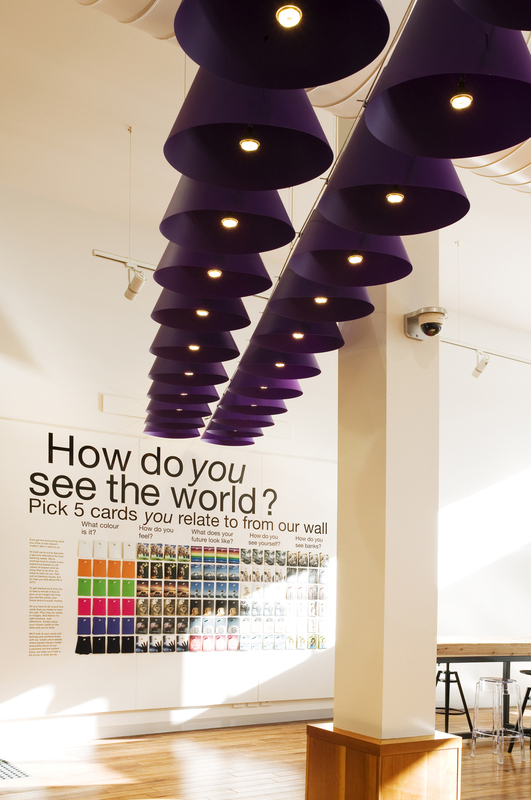 Guests coming into this space are confronted by a bright display of post cards featuring appealing images and intriguing questions. 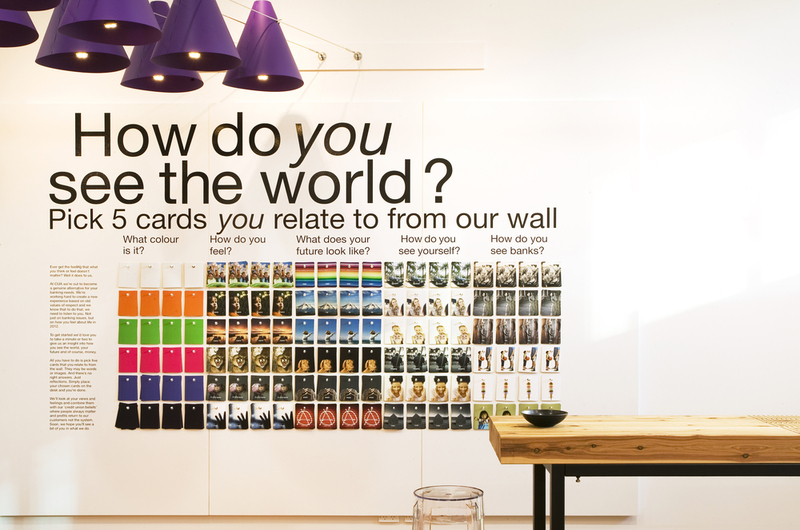 The wall is broken into zones, each featuring a thematic question related to the exhibition theme The post card installation asks customers to respond to questions about their lives and finance. 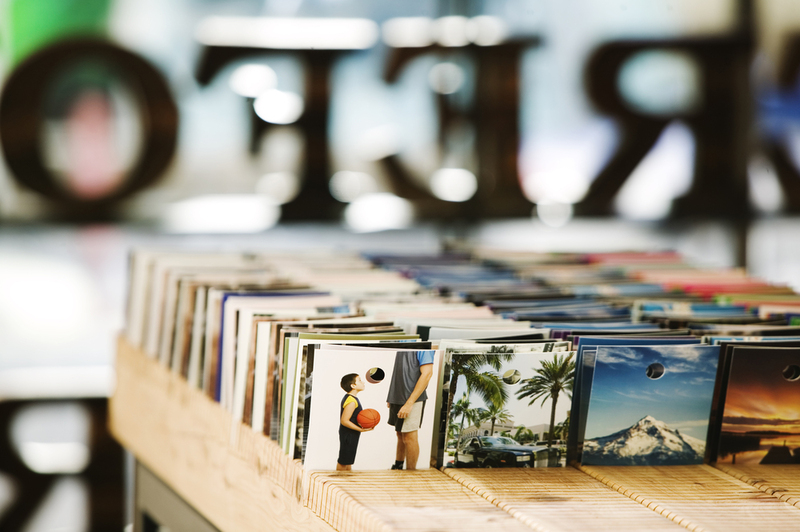 Customers are asked to select a card under each question that best express their response to that question. They place their cards upside down on the kitchen table. 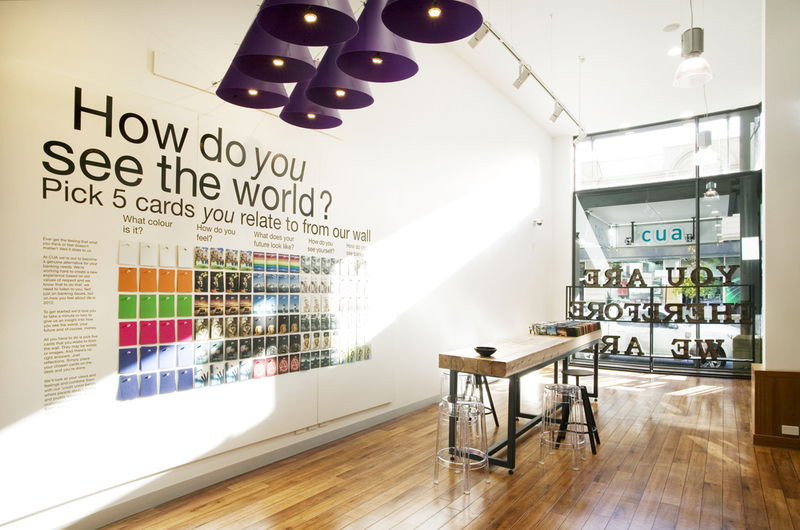 The resulting installation on the table, able to display many customer's cards at a time acts as a visual installation and feedback about customer sentiment. The exhibition wall features a simple explanation about how to play this game on the far left hand end. Customers are asked to vote or 'show their cards' by leaving them upside down on the community table in simple designated slots. This becomes a graphic representation of customer voting for particular emotional responses. Having voted customers can gauge how other customers have responded. The whole exercise is a very low-tech, very simple, intuitive, tactile participatory game and exhibition. Data from the respones has been collected and is now being incorporated into the design of the new store. The community table has a conversation area with chairs for people to wait and talk.